Review posted November 29, 2018. Sterling, New York, 2013. 557 pages. This book takes an excessively long time to read, but it's so interesting. I began by alternating reading from it and reading from The New York Times Book of Mathematics. That took way too long -- so I read the math book first, then worked on this one. 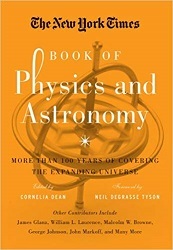 This book is made up of actual articles about advances in Physics and Astronomy, taken from the pages of The New York Times. I read an article per day most days -- for a very long time. My one strong recommendation is that for each article, you look at the end of the article to find out the date it was written, so you know if you're reading about current developments in physics or old news. I was surprised how early some things were discovered. Because this is from the pages of the newspaper, all the articles are written with a general audience in mind, and so are basically understandable. It gives a nice overview of the progress of physics in the last century or so. Chapter titles give you an idea of the scope of this book (each chapter is a collection of many articles): "The Nature of Matter," "The Practical Atom," and "The Fate of the Universe." Neil deGrasse Tyson says of the journalists who wrote these articles, "And I also came to see their telling of this timeless and epic adventure of cosmic discovery as a kind of time-capsule-in-the-making -- a chronicle of our species' search for how the universe works and what our place within it might be."